What I like most about class books is the opportunity for differentiation. The children write at their individual ability levels. The range of developmental levels of my first graders is significant, pretty typical for a first grade classroom. More capable writers spend time writing sentences, while those students who need support with letter identification and formation or sound-letter correspondence, receive the support they need. Class book writing is a great activity that allows students to be successful at their ability levels. Class books are also a terrific resource in our classroom library and great for daily centers. Many children choose to read the books during self-selected reading and the read to others centers. The students re-read the books all year long - literally. Most first graders love the opportunity for creative expression. Illustrating class book pages provides time to be creative. Class book writing also allows children to become authors and illustrators, and provides them with a great sense of accomplishment and pride. At the beginning of the school year, I typically use a lot of sentence frames and the children add words to complete a sentence. I provide room on the page for the more capable writers to add sentence(s) or they use the back side of the page. Spacing and the ability to write on lines is challenging for most first graders, and this activity provides the repeated practice they need. I try to use as many sight words as possible in the sentence frames at the beginning of the year because it’s great sight word reading practice. At the end of the school year, our wonderful office staff takes each book apart and individual student pages are bound together for unique keepsake booklets. Many families have expressed appreciation for the collection of writing samples. The first week of school, the children created a math book based on Ten Black Dots by Donald Crews. The objective was to use colored dots to create and write about individual designs. The students listened to multiple readings of the fabulous book, The Incredible Book Eating Boy and then, created a flap book about their favorite books. Student working on his page for the lift the flap "Favorite Books" class book. After we interviewed all the children in our class for the Four Blocks© Special Child of the Day activity, I typed the interview response writings and the children added pictures to their pages. I typed the student writings and the children added a picture in this frame for the Special Child of the Day class book. 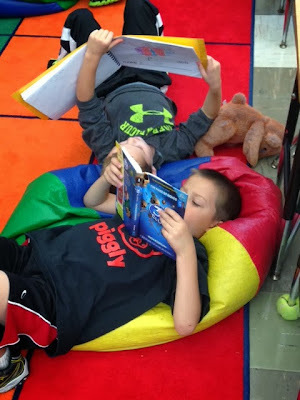 Student choosing to read a class book during the read-to-self center.